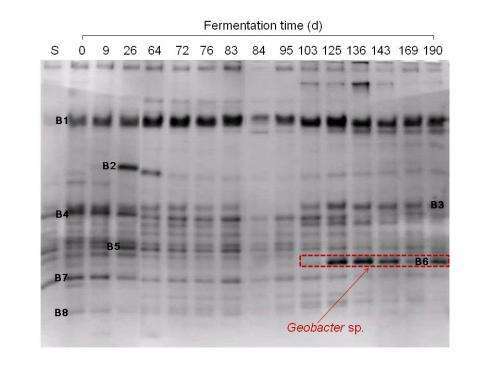 The courses of the PCR-based DGGE fingerprints of bacteria during methane fermentation. The number and character “S” over each lane show the age in days after the onset of methane fermentation and seeding material, respectively. Methane fermentation is a complex microbial ecosystem where various microorganisms coexist. This complexity makes it difficult to quantify the operational conditions required for stable and highly efficient methane fermentation. Although the organic loading rate is increased during the acclimation process to improve the performance of reactors, a sudden discontinuation of methane production is noted. However, there have been no reports on a reliable method to predict this occurrence. Now, Kiyohiko Nakasaki and his colleagues at Department of International Development Engineering of Tokyo Institute of Technology have identified a bacterium belonging to the genus Geobacter as an indicator microorganism that obstructs methane fermentation. During the acclimation process, the rate of methane gas production was monitored, and changes in the structure of bacteria and archaea communities involved in methane fermentation were measured using a DNA-based method (PCR-DGGE). Geobacter sp. utilizes the hydrogen required for methane production by archaea and thus inhibits methane fermentation. The results of this study suggest that stable and highly efficient methane fermentation can be maintained by controlling the organic loading rate on the basis of the results of the population density of the Geobacter sp.